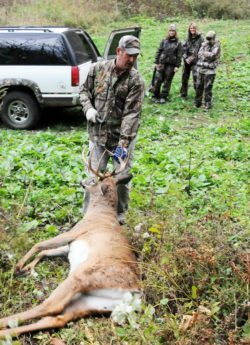 Hunting requires continued learning and practice in a number of areas just like any other outdoor or recreational activity. Beyond shooting well, you have to understand animal behavior, movement, indicators of presence (the tracks and “deposits” left behind) and habitats. A majority of hunters grow up “learning by osmosis”. I like to say; experiencing it throughout childhood with an experienced adult. For those of us without the fortune to grow up in such fashion, we have to find other options. This could be self-learning or guided learning, i.e. mentors. Some in the traditional hunting world sometimes use the term “adult-onset hunter” (for a clever explanation of the phenomenon, check out the author of The Mindful Carnivore, Tovar Cerulli’s post here). Fortunately, I had some great early mentors to get me started. Here are the first four ways to become a great mentor. What ideas do you have about hunting? How difficult or easy do you think it will be to see animals? What level of exercise do you think you’ll get? How long do you think this will take? What senses do you think you will use most or least? What is your biggest fear or greatest concern? Let your mentee tell you what they’re thinking. You need to see how far off their expectations are from what is going to be the likely reality. Have a discussion about where expectations might be a little high. If you don’t have this discussion, no matter how you think you did as a mentor regarding teaching skills, if you didn’t meet or exceed their expectations, you have a lesser chance of them walking away with a great experience (and then coming back). Spend time assessing their skill level as well as talk about their goals. Maybe their goal is simply to learn at first and not necessarily to harvest an animal right away. Putting too much pressure on too soon can result in a bad overall experience. Everyone is different so make no assumptions. Ask. Check your ego at the door and really listen. I recall many years ago a teacher in an urban St. Paul middle school taught kids about hunting and then took them on their first outing. He thought he had prepared the kids in every possible way, but when he took them out early the first morning, many came back within the hour because they weren’t prepared for the quiet and dark of the woods before daylight. They had never experienced that kind of peace and, quite frankly, were a little scared of it. Go so far as to prepare a timeline and with it, some comments about each process, the senses that might be triggered and if this is something your student has ever experienced before. If not, you’ll want to talk about it. Use open-ended questions rather than assumptions to gauge what they are expecting from the experience. Using questions with yes or no answers is less likely to get you the full story. Relationships are always a two-way street. You should go into each of them expecting to learn as much from them as they are from you. If your decision to mentor was to depart your knowledge and you aren’t thinking about the needs of the student, please spare us all and walk away. There is a distinct line between telling someone what to do and helping them become independent. Help them find a social system if they don’t already have one; some new hunters of the same gender, age or background. Having a group of people with which to communicate and exchange information is better than hearing from only you. Remember that this is a process. Each day will come with new learning on both your parts. Be flexible with the student. If they want to come in after two hours when you planned to be out for five, so be it. If it’s too cold for the student and he/she doesn’t want to go out as a result, don’t make them feel bad about it. Push them a little more each time so courage develops, but don’t create a situation where you’ve pushed so hard you’ve turned them off. “A good mentor makes it all about you and your experience (the hunter). It’s about having the best time, not the best hunt. I can’t make animals show up but I can do what I can to create the best stories” says hunting guide Dan Treankler. Now that’s how relationships are built! 3. Be positive – always. Use words like can, do and try. Avoid words like don’t or never. Bad mouthing of other mentors, guides, facilities, hunting locations or equipment should be shunned. Demonstrate the behaviors you want each student to pick up. That means words and values and not just specific hunting skills. Want patience? Be patient. Want students to be observant? Observe them. I recall my first experiences with tree stand hunting. I’m a little afraid of heights and had concerns about climbing and shooting from, but even more so, descending a tree stand; not just my body, but all of my equipment as well. Dan knew this (because he’d inquired) so when I arrived at my first stand, he watched as I ascended and made sure I was safely settled in and comfortable before leaving. Because he knew the descent was my greatest concern, he said that if I wasn’t at our designated meeting spot at the end of the evening, he’d come out and help me down. I wasn’t. He did. He climbed up the ladder and guided my boots to each screw-in step until I reached the ladder. When I appeared comfortable making my way down the rest of the way, he proceeded to ask me about what I’d seen, if I enjoyed it, how I felt about continuing with tree stands etc. Never once did I see any eye rolls or sense anything but complete sincerity and curiosity. His positive attitude made me want to continue trying new tree stands during my hunt and am know fairly comfortable on my own. It’s the tall, skinny, swaying trees that are still a challenge for me. Understand what your student needs and desires for his/her version of success. There is the obvious safety stuff here; gun and bow safety, walking with equipment – you know, all of the stuff you learn in hunter education classes. Spend time on these safety aspects before you go out, like putting on a harness, climbing a stand, bringing up gear etc. This helps create good habits. What’s equally needed, though, is the feeling of safety to ask questions or tell stories without judgment. Make sure the student is as comfortable as possible and not afraid to ask for help. Just because you are comfortable doesn’t mean someone else is. When Dan dropped me off or picked me up in the dark, he always had a flashlight or directed the vehicle’s headlights in my direction so I could see better, even though I used a headlamp. He’d check to make sure I was warm enough. Sometimes, he even checked to make sure we had tissues, water and other “necessities” (there’s another story around a “girl kit” we were going to make for him to have it his truck – maybe a reason for another blog post). I recall once hunting with other Archery Trade Association staff, a bear slumbered by two stands. Nothing happened and one of the two gals’ jokingly texted asking if she was for dinner tonight. To reduce fear, future new hunters were always given a little primer on bears in the area and given the opportunity to avoid any tree stands or blinds where bears had been seen. The best mentors make their students safe in both the belonging and protection senses of the word. Mentorship expert, John Crosby, once said, “Mentoring is a brain to pick, an ear to listen, and a push in the right direction.” Dan definitely met these requirements as a mentor. In the next post, I’ll cover three more traits of a great mentor. To read Part 2 of the series, click here. Note: the picture is from Bluff Country Outfitters in Buffalo County, Wisconsin. Check them out here.